Organizing for some people (okay, me!) is such a challenge I often put it off for as long as possible (admit it, so do you). It really doesn’t matter what the project is, I just don’t want to do it. Just the word “organizing” gives me cause to shudder because it implies so much work ahead. So, while I struggle with small-scale stuff, PODS® is in the business of helping those who require major overhaul jobs. In fact, PODS was recognized as one of the nation’s best service providers by the National Association of Professional Organizers (NAPO) Wait. What? There is an organization existing solely for the purpose of organization? Apparently, yes Virginia, there is. Hmmm. Maybe there is hope for me, after all. Remember the days when “spring break” meant taking a vacation to a beach destination? You know, that halfway break between winter and summer to relax and rejuvenate with the family. Where have those days gone? Sometimes, it is no fun being an adult. A few years ago I took a week vacation from work and stayed home for spring break with my kids. It was a week I took to get organized because let’s face it there just is no time to get down and dirty with the household unless you have a big chunk of time, and I needed a big chunk of time. I didn’t own a truck and the nearest mini storage center was 10 miles away. This posed a major inconvenience. So, I called PODS®. Amazingly, they delivered a PODS® container the first morning of spring break and the kids and I got to work. Incentives to helping mom included afternoons at the beach or local amusement park, and fun sprinkled throughout the week to give us all respite. It took more than a week, however. For 3 weeks, the sturdy PODS® container sat in our driveway while I took the time to do things right. There was no driver standing by in a truck and no 20-mile round-trips in the car to load and unload boxes into a storage unit. Instead, I had everything a few steps away with access 24/7. Talk about giving mom a break! I am not macho. I avoid heavy lifting whenever I can. I might break a nail or something. My teenage son has no problem telling me he can do it, so I let him. PODS® is much the same, providing delivery and pick-up of a really big box (PODS® storage container) and taking all the weight of a relocation, renovation, remodel or as extra storage. 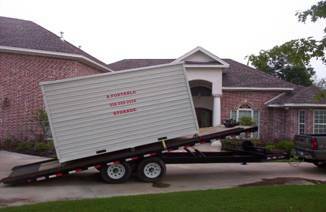 Recently, a PODS® container was delivered to our driveway as we set out to completely remodel our downstairs living areas. At ground level, my strong uncles removed heavy furniture and appliances into the open storage container and my teenager happily carried boxes until he was bored. Then, I took over with the light stuff. No one was rushed since we can have the PODS® container onsite for as long as we want. In this case, however, I was unable to keep it at my home, so PODS picked it up a week later and transported it back to itsStorageCenter just a few miles away for short-term storage. 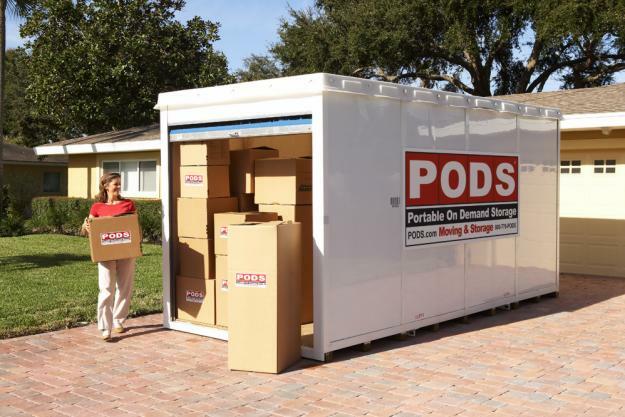 PODS moves, stores and delivers with three sizes of PODS® containers to fit the contents of your home. The largest, 12×16-feet, will transport an average 3-bedroom home. Comic George Carlin was right in his sketch about people having too much stuff. If you’ve never seen this particular routine, search for it on the Internet and you’ll get what I’m saying: We have too much stuff. I’m guilty of this sin and no matter how hard I try, it keeps piling up. I’m out of closet, garage and attic space. Stuff is overflowing and it’s creating chaos. I need to donate or sell or trash (I mean, recycle) a lot of my stuff but I’m not ready for that yet. What I am ready for is extra storage, but I live in a private condo community and there is no extra garage or space to install a portable shed or anything like that. Recently, I came across an advertisement for PODS®. These portable containers can be packed and stored in a local warehouse and not on my property. What a great solution! When I called my local PODS office a nice lady explained how PODS works. Apparently, I am not the only person who has too much stuff. The technical term used in the industry she said is “de-cluttering.” There is a term for having too much stuff? Apparently! Great, more guilt. In a nutshell, PODS provides a hassle-free solution to short or long-term storage that begins with the delivery of a container. The customer is responsible for filling it up and calling for back-up (I mean pick-up) and it’s off to the storage center for safe-keeping until I want all of my old stuff back. What began as an innovative moving and storage service in 1998 has evolved into a disaster recovery solution for government, social service agencies, businesses and homeowners. The PODS® Rapid Response Team was formed to protect and salvage the possessions of citizens ravaged by storm or disaster. Pre-event or post-event, PODS® containers can be used to transport food, water and medical supplies to impacted areas or as a storage container for household items and assets of homeowners and businesses. Safe and secure. PODS® containers can be stored onsite, conditions permitting, or at one of our nearby PODS secure Storage Centers. You have the only key to your PODS® container. Your belongings are safe and protected. Rapid deployment into impacted areas. PODS can respond promptly to the needs of residents, businesses and government entities. PODS® containers can also be staged in advance of a disaster to increase response times. Competent, trained drivers. Our drivers are specially trained to handle emergency road and delivery conditions. Rugged and weather-resistant. PODS®containers are made of steel frame construction with a water-resistant seal and can withstand winds up to 110 mph when partially filled. PODS is part of every local community it serves. Franchises support local organizations and nonprofits and participate in philanthropy. We care about the people we live and work with and are here to help in unpredictable events. To date, PODS has made more than 1.6 million deliveries and completed over 300,000 long-distance moves. With PODS in locations across the U.S., Canada, Australia and the United Kingdom, franchises serve more than 22,000 cities and 240 million consumers and businesses. PODS®, The Best Moving & Storage Idea EVER!™ Visit PODS.com today for more information.